We’ve got some major news! It’s no secret we love incorporating video into our marketing strategy in any way possible, and now we are taking this love affair to a whole new level by launching a new video every week on our YouTube channel! We touch so many different facets of the printwear industry and see a huge opportunity to educate and inspire people through the content we create. 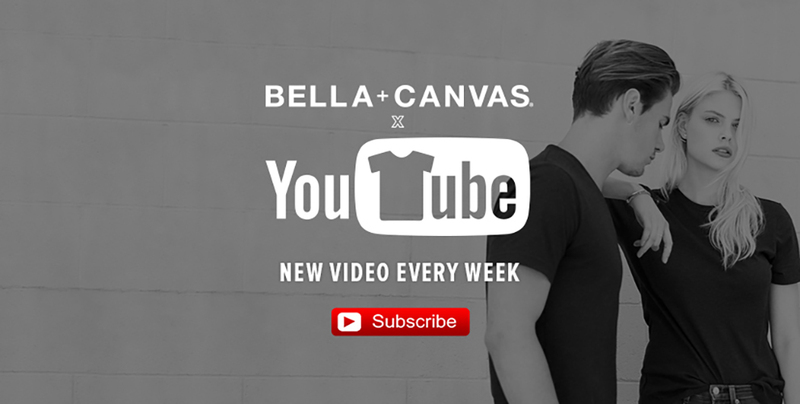 At BELLA+CANVAS, we always strive to be as transparent as possible, and through these videos that’s exactly what we will do — provide a lens that grants an all-access perspective into this enormous blank apparel industry. So how exactly will we do this? Below is an overview of the different topics we’ll cover! This series will cover all things related to Direct to Garment Printing. It’s looking like DTG just might by the future of apparel printing. As more business is done online, in the world of one-off or small run orders, custom is king. DTG is a relatively new technology that is rapidly advancing to turn out faster, brighter and better prints. In our DTG Takeover series, we partner with some of the best DTG manufactures and printers out there to talk about tips for DTG printing on a variety of BELLA+CANVAS fabrics. We have so many amazing colors, fabrics and silhouettes, but we also know figuring out exactly what to do with them can be overwhelming. In our Design Inspo series, our goal is to inspire you by showing which printing techniques pair with which fabrics, color combos that go well together, and graphic design trends that elevate your designs and set your company apart. Looking for advice on how to run and grow your business? We will share tips and success stories from customers who have built tremendously profitable apparel companies from the ground up. Learn about their growing pains and how they overcame them through our Insider Tips & Tricks series. In this series, you’ll get an inside look into the forces behind BELLA+CANVAS. You’ll see how we embody our motto to BE DIFFERENT in every facet of our business. We’ll show you the ways we’ve refined our operations to be an eco-friendly manufacturer, give you a tour of our factory and even give you a peek at how we develop new product! Plus, we’ll share tips for getting the most out of our website resources, tools and all we have to offer. Have we sold you yet? Experience it for yourself by subscribing to our YouTube channel. And don’t forget to check back each week for more!